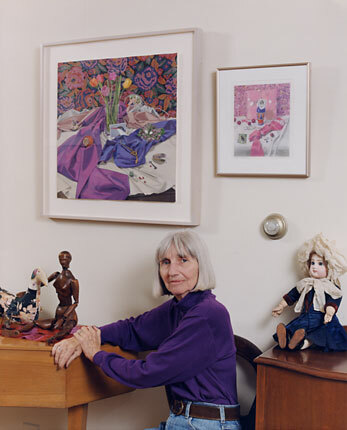 Known for her hyper-realist style, Carol Rosenak (1925 – 2002) considered still-life painting her best, most evolved work. With perfect linear precision and a heightened vibrancy of color, her interior scenes juxtapose everyday items such as pushpins and chairs with delicate flowers and vases. Educated at the Chicago Art Institute, Rosenak began her professional art career in Chicago. After a move to San Francisco, the artist joined an artist co-op on Union Street and quickly began to gain national attention and critical respect. Soon her works were selling to collectors in California and throughout the United States. Tragically, in 1994 Rosenak suffered a series of strokes that left her partially blind. At that time, the artist ceased to paint entirely. Her still life series, which demands such precise and delicate vision to execute, never saw another addition. After several years, Rosenak’s passion to create coaxed her to the easel and she began to paint again. She soon realized that if one’s artistic principles are intact, even diminished sight cannot obscure one’s vision. Her most recent work is predominantly abstract with certain elements remaining constant; her strong and vibrant color, her sense composition and attention to detail. Carol Rosenak’s documentation took place in 2002. The FOTM Archive contains extensive information about this artist.